The last module is completed. Congratulations! 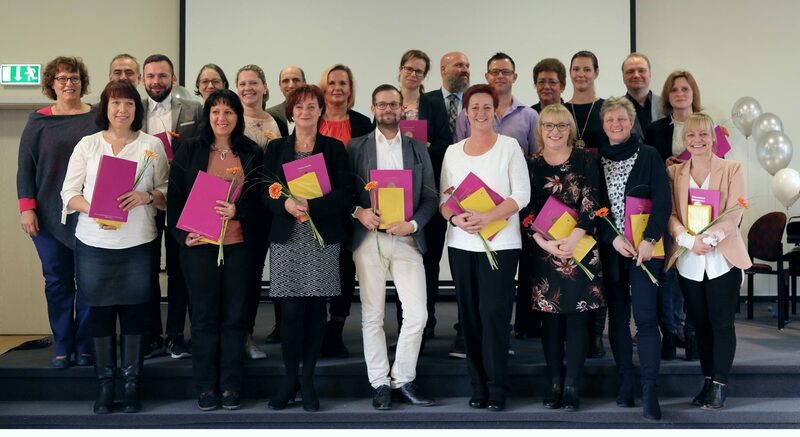 The University-certified training for nursing management ended on November 27, 2018, after 9 modules and 4,5 years of learning together. In the festive hour, the participants presented the learning content competent and informative for the attending guests. The managing director of the clinic in the “Pfeifferschen Stiftungen” Tobias Bruckhaus and the care manager Katharina Scholz gave laudatory words about the collaboration between “Pfeiffersche Stiftungen” and Friedensau Adventist University. As a University, we want to thank for all involved professors and teachers and especially the manager of the training offer Prof. Dr. Margarete Reinhart. Good luck in implementing the learning content to the well-trained leaders!